Although this image seems simple, it represents two weeks of work. Most of this time was spent using Bryce to create the nebula you see lingering across the cloudless, starry night sky. The Fairy's wings are made from non-transparent Bryce terrains. You could compare them with the transparent wings used in the image "Look There" to decide for yourself whether you prefer solid or transparent wings on Fairies. Tell me what you think! 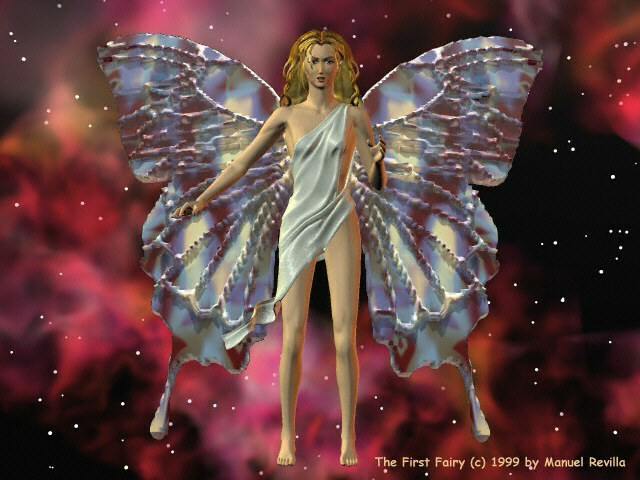 The First Fairy is copyright 1999 by Manuel Revilla, all rights reserved.